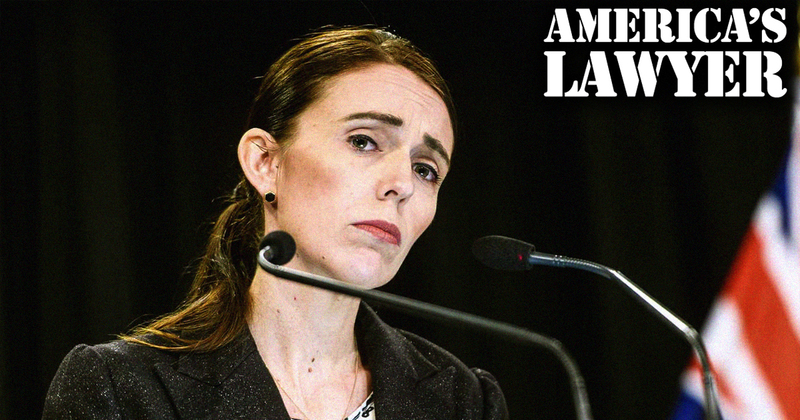 Via America’s Lawyer: Just six days following the deadly mass shootings at two mosques in the city of Christchurch that left at least 50 people dead, New Zealand Prime Minister Jacinda Ardern, announced that the country would be banning all military style semi-automatic weapons. Farron Cousins fills in for Mike Papantonio on this episode of America’s Lawyer to explain more. And finally tonight, some good news. The country of New Zealand recently showed the world how to respond to gun violence. Just six days following the deadly mass shootings at two mosques in the city of Christchurch that left at least 50 people dead, New Zealand Prime Minister Jacinda Ardern, announced that the country would be banning all military style semi-automatic weapons. Think about that for a second. It only took six days to make this decision and the announcement. Meanwhile, here in the United States there has been no fewer than 61 mass shootings since the start of 2019 not even three full months into the year and the best we get from our elected leaders are their thoughts and prayers. The saddest part of the gun violence story is that the United States for many years actually did ban assault weapons. That ban expired in 2004 and Congress made the decision to not renew it, which only allowed these weapons of war to make their way into the hands of average citizens. The truth is that no civilian needs a semi-automatic rifle. The arguments for keeping these weapons on our streets would be considered laughable if the consequences weren’t so disturbing. There are plenty of options for protecting your home or hunting that don’t involve a rifle capable of dismembering a body in under a minute. Yet that’s exactly what these high powered semi-automatic weapons can do, and that’s actually according to the coroners who’ve had to see the damage from mass shootings in a way that most of us, thankfully never will. New Zealand just set the bar for how to respond to these atrocities, and we have to hope that the rest of the world will eventually follow suit and realize that this isn’t about taking away your rights. It’s about protecting the lives of innocent civilians.